The Detroit Boat Club was founded several decades before Detroit showed any signs of becoming an industrial metropolis. It is the oldest rowing club in the United States and the second oldest continuously operating rowing club in the world. Rowing was, perhaps, a much more popular sport for prosperous men in the first half of the Nineteenth Century than it is today. Seven men met and founded the Detroit Boat Club on February 18, 1839. Two of them were members of the Brush family, the Connecticut family than gave their name to Brush Park. Another was Alpheus Williams who went on to glory as a civic leader and Civil War General. The impressive statue of General Williams on a horse in a rainstorm stands on Belle Isle, not more than one-third mile from the Detroit Boat Club that you see. 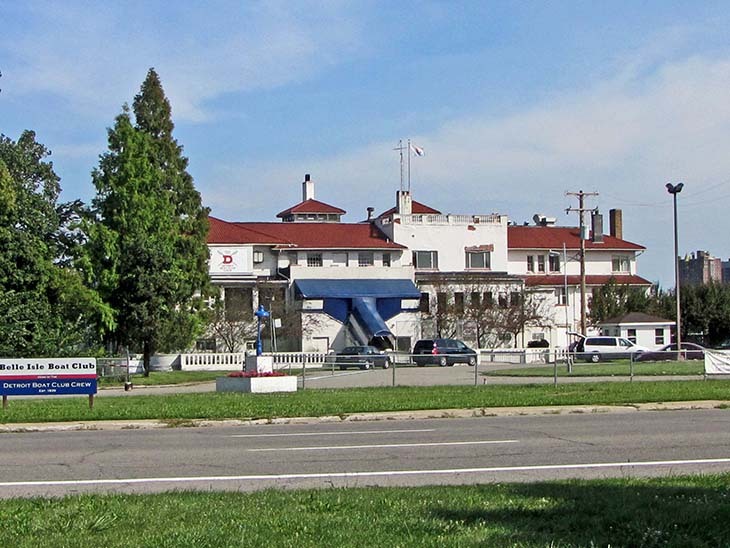 In addition to claims about longevity, the Detroit Boat Club may make claims about the peak number of clubhouses lost to fire, demolition and bankruptcy. Their first clubhouse was a wooden structure erected at the foot of Hastings Street on the mainland, but that one burned to the ground in 1848, a fire that destroyed all boats but one. In 1873, the club opened a plush clubhouse at the foot of Joseph Campau where the appealing Parke Davis complex—a National Historic Landmark—now stands. To improve the waterfront for industrial development, the city of Detroit, in 1889, offered the Detroit Boat Club an attractive location on Belle Isle at the foot of the bridge from the mainland. In 1891, a wooden clubhouse was built on the location you see but, alas, it also burned to the ground. Not deterred by two catastrophic fires, the Detroit Boat Club commissioned the John Donaldson and Walter Meier firm to build another wooden clubhouse for them on the same location. It was completed in 1894, but burned to the waterline just seven years later. A picture of this large, attractive boat house is shown in W. Hawkins Ferry’s The Buildings of Detroit: A History. Three major fires apparently taught the leadership a lesson. They asked Alpheus W. Chittenden to design a building that would withstand fire. He was born in Detroit but studied architecture at MIT, and then returned to the Motor City to specialize in designing residences. He was also a member of the Detroit Boat Club. The building he designed for his club was a Spanish Colonial Revival style structure done in white stucco with a traditional red tile pitched roof. It is a very attractive building. I have not seen the interior but descriptions suggest that Chittenden devoted at least as much attention to making the interior as attractive as the external façade using a nautical theme wherever appropriate. Think about where a middle-class young man could court a young lady in the era before automobiles and movie theaters. Where could they find privacy? Apparently, more than a few middle-class young Detroit swains took their lady friends down to the Detroit Boat Club, used they own scull or rented one, loaded a picnic basket and then rowed showing a bit of their biceps. They could row to an isolated corner of Belle Isle where they could enjoy their picnic, some conversations and, if the stars were appropriately aligned, some flirtation. Apparently, that does not happen much any more on Belle Isle. There are many stories about the beautiful Spanish Colonial Building that you see in this picture. One story is that the building is not formally on Belle Isle but rather was designed by Chittenden to rest on stilts placed into the Detroit River. 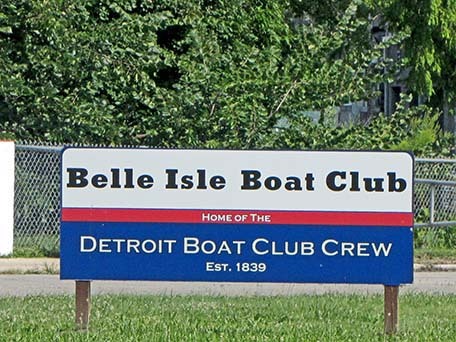 Apparently, there was fear that the city would prohibit the sale of spirits on Belle Isle but, using this ruse, the Detroit Boat Club could go on selling alcohol to its members and their guests. Another speculation is that the building was built on stilts so that rowers could lower their sculls into the water from the building itself. Apparently, the exposed bottom of this building was covered shortly after its completion. The Detroit Boat Club prospered into the 1960s. It offered courses in swimming, rowing and sailing. Apparently, many prosperous Detroit whites joined and their teenaged children enjoyed spending their summer days at the Detroit Boat Club with its Olympic-sized pool. It was, seemingly, a mark of status for Detroiters to hold a membership in the Detroit Boat Club or the Detroit Yacht Club—a nearby club with a focus on yachting. Racial strife pervades the history of Detroit. In 1969, the city government officials observed that both the Detroit Boat Club and the Detroit Yacht Club limited their membership to whites. They both had very favorable leases with the city, paying just $1 per year for rental of land on Belle Isle. The city government proposed to terminate these leases unless both clubs agreed to accept African American members. The clubs fought back and argued that they had legitimate leases and that the federal Civil Rights Act of 1964 did not apply to them since they were private membership organizations not public organizations. After five years of lawyerly negotiations and threatened litigation, the clubs agreed to accept black members during the first year of Mayor Coleman Young's administration. By the late 1970s, both clubs faced challenges in maintaining their memberships and financial prosperity as the city lost several hundred thousand prosperous residents to the suburbs. Many of those interested in yachting and rowing had moved to the suburbs and could join much more accessible clubs. Many also felt that there was some risk to going on to Belle Isle or being there after dark. The Detroit Yacht Club came through this difficult period and continues to offers its members ideal facilities. The Detroit Boat Club was not so fortune. In 1991, the city announced that the rent charged the Detroit Boat Club would increase from $1 per year to $100,000. About three years later, the organization went into bankruptcy, although some blame administrative mismanagement as much as the city’s increase in rent. In 1996, the remnants of the Detroit Boat Club abandoned the building and announced that they would look for another home. During Mayor Archer’s administration a developer proposed remodeling the building and making it into a very upscale marina. Nothing came of that plan. TheDetroit Boat Club has used this building rather frequently in recent years for rowing events in both the winter and summer. Since about 2001, they have undertaken a modest project to refurbish the once very attractive building. The building may be owned by the city but I believed that the revived Detroit Rowing Club has a lease for the building. In early 2012, the organization announced that they would refurbish the building. This may be fostered by the in-migration to Detroit of young professionals, some of them members of crew teams while in college. The interest in rowing in Detroit may be growing. If you look carefully at this beautiful building, you will see evidence of the improvements that have been accomplished recently, but also evidence of the remolding that is still needed if this building is to be returned to the glory of its state as designed by Detroiter Alpheus Chittenden. State of Michigan Historical Marker: Belle Isle is listed on the State register. Use in 2012: This building is slowly being remodeling by the Detroit Rowing Club.